This is exactly how dinner should be: fast, easy, and full of flavor! 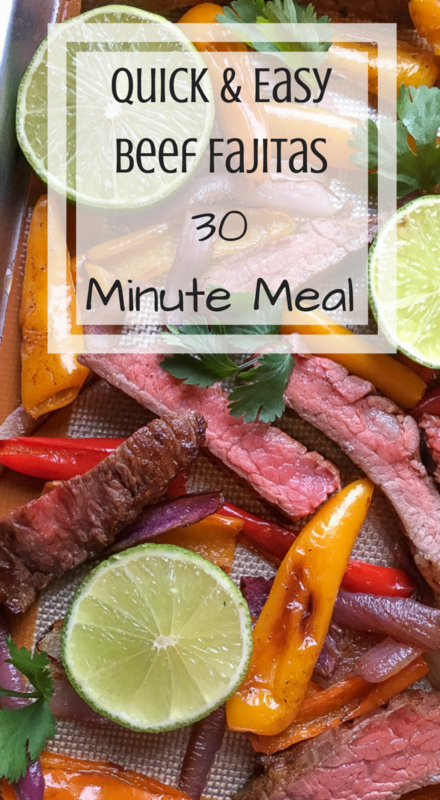 I love that this tasty meal on the table in 30 minutes. However, if you have a little bit of extra time you can marinate the steak ahead of time with some olive oil and the dried spices listed below for some extra flavor, but it’s not necessary. If you’re like me you’ll figure out that you’re making beef fajitas about 40 minutes before dinner needs to be on the table. For best results, use a three-quarter sized sheet pan for this recipe versus the more common 13” x 18” half sheet pan. This will allow extra room to spread the vegetables out into a single layer without overcrowding while roasting. More Delicious, Low Point Weight Watchers Freestyle Recipes Here! Preheat oven to 400°F and line a large, rimmed baking sheet with parchment paper or a Silpat® baking mat. Set aside. In a large mixing bowl, combine sliced flank steak, peppers, red onion, olive oil, cumin, chili powder, cayenne, and red pepper flakes. Generously season with salt and pepper, to taste, and mix until everything is well coated. Spread the steak and pepper mixture onto the prepared baking sheet and roast in pre-heated oven for 15-20 minutes, or until the steak reaches the desired level of doneness and the peppers are soft and slightly caramelized. Remove sheet pan from oven and sprinkle with fresh cilantro and a squeeze of fresh lime juice. Serve immediately with diced avocado (add 2 points for 1/4 cup), corn tortillas (add 2 points for a 6″ corn tortilla), or lettuce wraps (ZERO points) for a low-carb option, if desired. Enjoy!